Central African Republic has approved a law creating a special criminal court to investigate allegations of war crimes and crimes against humanity in the war-torn nation, lawmaker Ernest Mezedio told Reuters. 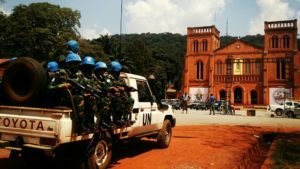 According to Najat Rochdi, UN humanitarian coordinator in Central African Republic and deputy special representative of the United Nations in the country, the special criminal court which is expected to try the worst crimes committed in the country, is due to start its formal investigations next week. The tribunal will be based in the CAR and composed of both national and international judges. About 2,000 UN police are helping national authorities to arrest high-profile suspects, Najat Rochdi said. The Central African Republic has experienced several periods of armed conflict since its independence in 1960. Major violence erupted in 2003 since former President Francois Bozize seized power in a coup d’état. And again in 2013 when mainly Muslim Seleka rebels ousted Bozize, prompting reprisals from mostly Christian militias. Thousands of civilians have been killed, and despite executions and sexual violence by all sides, only a handful of people have been prosecuted in the national courts. The new court was agreed to in 2015 with a special prosecutor, judges, chief register, and investigators appointed. With the adoption of the court’s procedural rules, the prosecutor is set to formally move ahead with investigations. Posted by Geraldine Boechat on June 1, 2018. Filed under Zoom. You can follow any responses to this entry through the RSS 2.0. Both comments and pings are currently closed.